We recently ran a Kata class for members, it focussed upon a number of key Kata, split by grade and ability and the key principles and concepts within each. Although these three kata come from different style, they all cover similar concepts and . and their affect on the delivery and performance of the Kata itself. Two days before Christmas I had the pleasure of spending an afternoon at a friend’s house. Laid out on the table was a jigsaw. The edges were complete but nothing else, hundreds of pieces scattered around waiting to be found and placed in an orderly fashion. As we sat I started looking for pieces to add to the puzzle and quickly became engrossed, all the while chatting, drinking and making merry. It is years since I sat with a jigsaw, but it was a lovely way to spend an afternoon. It got me thinking. Life sometimes feels like a large jigsaw made up from lots of little images, each one representing a different aspect of my life. An image of each of my children and my husband, all looking healthy and happy. An image of my home, warm, clean, tidy, happy and homely. An image of work, busy, successful, productive. An image of my family and friends, keeping in touch, spending time together. An image of myself, living up to the values I hold dear, looking after all those important aspects of my life whilst still managing to look after myself, being the best I can be. I have an image in my head of the stunning picture it would make when all the puzzle pieces are put together, an intricate web showing life which is serene and organised, everything running smoothly together, happy faces and beautiful places. 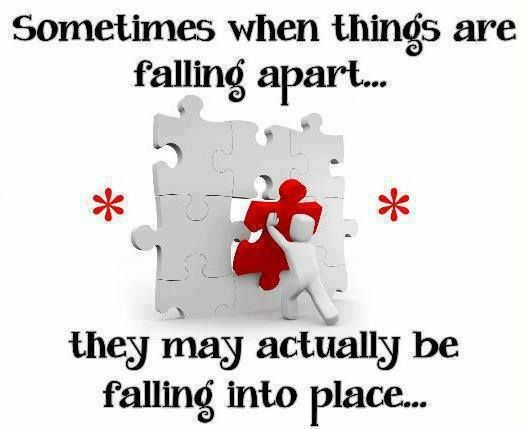 However, my jigsaw is far from complete. I stand in the middle of lots of pieces of the puzzle, they are chaotic. A jumbled up intermingled mess which often leaves me feeling like I don’t know where to start. Sometimes I feel like I am making progress and parts are coming together, the kids are doing well, work is productive, success at a competition. But when I focus too much on one area of the jigsaw, other parts are being neglected. How can I possibly pull this together? It doesn’t take much to make it fall apart again either, the car breaking down, a phone call with bad news, a bill when you have no money and the parts pull apart and I am left standing in the middle of the mess, feeling defeated. However, here’s what I learnt about completing a jigsaw. Puzzles are fun and they are made for the doing, not solely for completion but for playing with. When a jigsaw is complete all you can do is sit back and look at it, the interaction stops. Sure, you admire the picture, you appreciate the effort you put into the finished product, but then you think ‘what now?’ In time the picture fades and gathers dust, the perfect image becomes uninteresting so the pieces come apart and get put away whilst you fondly remember the fun you had putting it all together. Yes, sometimes it’s frustrating when you can’t seem to finish or find the right piece. Sometimes it’s tiring, monotonous even and feels like you’re getting nowhere. But then there’s the buzz of excitement when you make progress, a sense of achievement in working toward the completed masterpiece and it’s even better when you rope in friends to help you along the way. Sometimes you have to focus more on one area and that’s ok, you’ll be back to the other parts soon enough. So here’s what I’ll be doing in 2016. I will be viewing life a little differently, not pushing for perfection and completion but learning to enjoy the confusing, messy conundrum that it can sometimes be. Enjoying the moments where it’s all coming together and with the help of those around me working through the times where things fall apart or seem unmanageable. Life is for the doing, not the completion. It’ll come to an end soon enough, there’s no rush to finish. A perfect life soon becomes dull, losing its lustre and gathering dust. Nothing but an image of perfect happiness. True happiness is found when you revel in the mess, learn to enjoy the chaos and give yourself a pat on the back for those short lived moments where it all comes together.